By ordering ETA Kits, you warrant that you have the required training and authorizations to use the contained items. DS Tactical & ITS Tactical assumes no liability for their misuse. 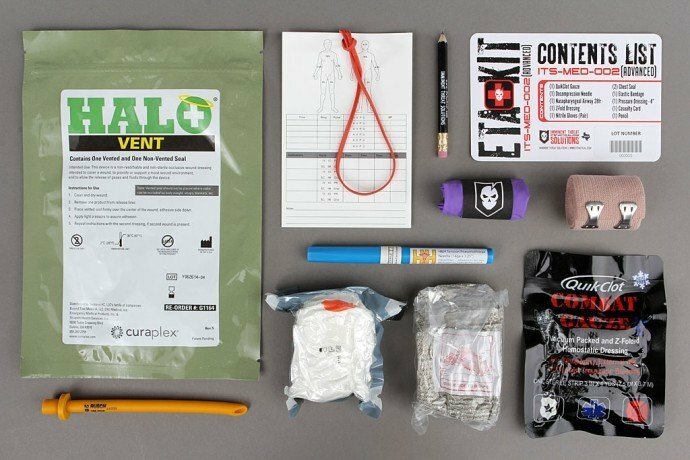 Developed by our 18D Corpsman and following the CoTCCC Guidelines, the ITS ETA Kit combines the best products on the market to treat the three leading preventable causes of death in the field. These are Extremity Hemorrhage, 60%; Tension Pneumothorax, 33% and Airway Obstruction, 6%. Our ETA Trauma Kits are available in a tall vacuum-sealed configuration referred to as the “Tallboy” or a wide vacuum-sealed configuration referred to as the “Fatboy." ETA Trauma Kits in Tallboy configurations fit our Tallboy Trauma Kit Pouches either sealed or broken down for easy access to the individual components. They’ll also fit sealed into other “magazine” sized pouches. Just make sure for best practice that where you’ll be carrying it is designated as containing a medical kit. Every item in our ETA Kit is carefully selected to complement the others and serve multiple purposes. We stress the importance of having an ETA Kit within your reach at all times and these have been made to conveniently fit in a cargo pocket, glove box, backpack, laptop bag, briefcase, you name it. For a more compact Pocket Trauma Kit, please check out the ITS EDC Kit. Purchasing an ETA Kit allows you to be prepared and carry the essentials to save your life and those around you. What’s a life worth to you? Just remember, it might not always be you that’s using your kit. Having the components available for someone better trained than you to use on your treatment can be just as important. We highly recommend augmenting our ETA Kits with the SOFTT-W Tourniquet and optionally adding Molly Stix to make an ETA Trauma Kit Pouch quick releasable. Each ETA Kit is hand assembled and vacuum sealed right here at ITS HQ in Texas. There are two different variations of our ETA Trauma Kit, Basic and Advanced. The Advanced components are shown below and the Basic Kit excludes the Decompression Needle and NPA. • Expiration dates vary depending on individual components, but we strive to provide at least a two-year shelf life for the first to expire item. *Each ETA Kit is vacuum sealed and completely latex-free.